Bohnne has some very helpful furniture placement ideas for your porch and is also a Certified Interior Decorator and President of INTERIORS by Decorating Den of Nashville. 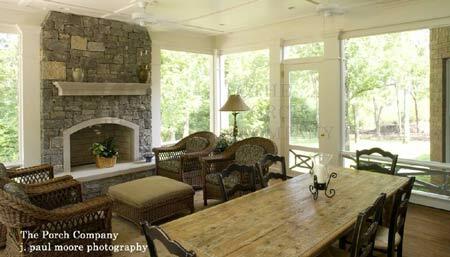 She and her staff provide residential interior decorating services throughout Middle Tennessee. Bohnne told me that one of today's home decorating trends is to "bring the outside in and the inside out". Perfect for front porch decorating! Makes it cozy and inviting. We asked Bohnne some questions about how to arrange furniture on the porch so that it is both pleasing and functional. I love her ideas for warming up a porch! 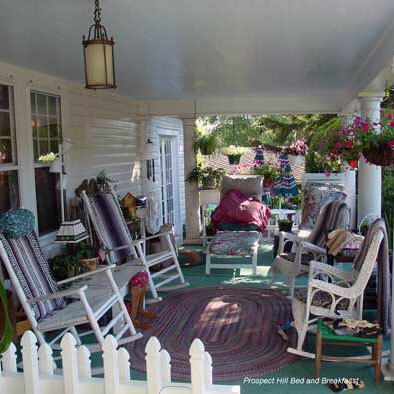 Visit Bohnne's other tips on decorating a porch and learn about Sunbrella fabrics, too! Mary: Often we get into a rut on arranging our furniture. Two chairs, a coffee table, end tables and a sofa. When thinking of a porch, what are some fresh furniture placement ideas? Bohnne: Four chairs can be a more flexible selection (skip the sofa) because the chairs can be placed in more comfortable positions for conversation. Dave and I recently had dinner at a couple's home who had a screened porch. The furniture on their screened porch was arranged just like Bohnne suggests: four chairs, no sofa. Made for a really comfortable arrangement. Mary: When placing furniture on the porch, how do you create both a pleasing conversational arrangement as well as allow the view of the front yard and neighborhood to be seen by those on the porch? Bohnne: So much depends upon the size of your porch - how much furniture can you fit? You certainly don't want people's backs towards the landscape. Back to the chairs vs. sofa, you can comfortably angle two chairs with a small table in between, keep the view in mind, and the conversation comfortable. Mary: How can you divide your furniture to create several sections - like a privacy area and an open area? Bohnne: Screens! They provide interest, can block the wind, and section off areas. As an added plus, screens can be moved around as needed to reconfigure your space. Mary: What are some furniture pieces that we overlook when decorating our porches? Bohnne: Floor and table lamps are fun to use - they can be electric or flame. Mary: You mentioned that area rugs are one way to really warm up a porch. Would you tell us more about the kinds of area rugs available? And how to care for those rugs? Can they stay out when it rains / snows? Do they need to be cleaned? Are they reversible? 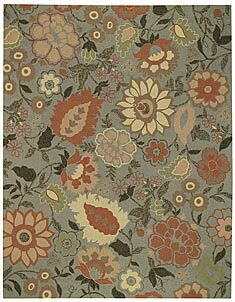 Bohnne: Select a rug that has been made to be used outdoors. Some can be used in covered areas only - like a porch, some will work out in the elements. These rugs are mold and mildew as well as fade resistant. Many of these types of rugs are reversible, and can just be hosed off for cleaning. I always recommend following the manufacturer's instructions. And, for the longest life of your fine outdoor furnishings, it is best if they are not left out or uncovered in the winter. Here are two examples of beautiful outdoor rugs. The first one is for covered areas, and is hooked with 100% poly-acrylic yarns. The second one is 100% polypropylene, and is reversible. It can be hosed off and hung to dry. 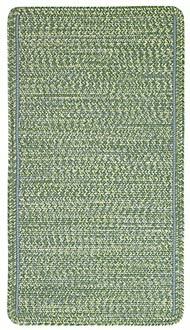 These beautiful braided rugs come in many colors and shapes and will provide many seasons of beauty for your porch! Mary: Wow, who would have guessed you could hose off a rug that is so attractive. That really is a nice way to warm up a porch. Thanks, Bohnne. 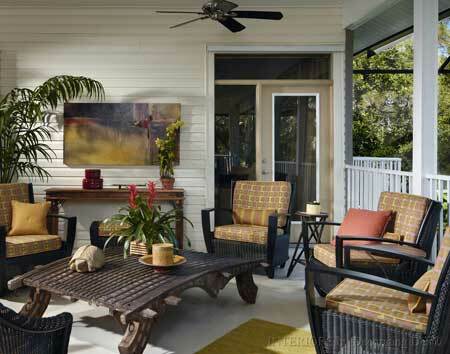 Mary: In addition to rugs, what kinds of accessories do you recommend for personalizing and warming up porches? Bohnne: Outdoor lamps - both floor and table varieties will also warm up your porch. 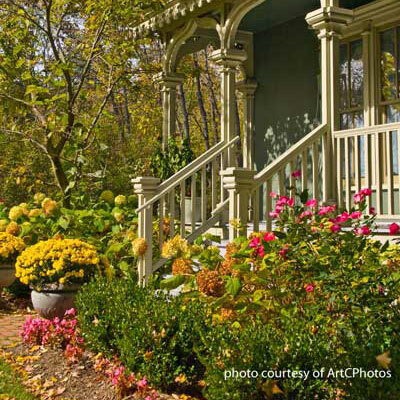 And of course, plants and flowers go a long ways in making your porch friendly and welcoming. Mary: Bohnne, thank you for sharing your furniture placement ideas with us. I like how your company, INTERIORS by Decorating Den of Nashville, brings products to people's homes, instead of customers going to a showroom. That is much more personal and convenient. And I also like that you suit your clients' design styles and budget. That's refreshing. And speaking of furniture placement ideas, I especially liked your idea of having four chairs instead of a sofa and two chairs. A simple suggestion like that can make all the difference in comfort.